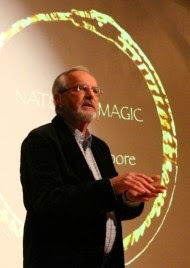 In 2012 Thomas Moore participated in Findhorn Foundation's Love, Magic, Miracles conference. Sandra Mitchell and Christine Lines describe his session on Day 4 with pictures by Sverre Koxvold and Graham Meltzer. Here is their description. "Continuing with the theme of magic, our speaker for this evening is Thomas Moore, perhaps known more for his books and talks on caring for the soul. Tonight he delivers an enlightening and often humourous presentation on what he terms natural magic, revealing the deep connection that exists between living a soulful life and living a life of magic. Thomas gives us his definition of natural magic, using the words ordinary and unexpected. It is to be found in our everyday experiences and in the material things with which we interact. Thomas illustrates this through the story of how he chose the topic for his doctoral thesis, introducing at the same time a particular form of magic which he calls book magic. You know, it’s the magic that happens when just the book you need at a certain time in your life appears from the most unlikely place. Thomas points out that music too has magic, something that I think we have all felt at one point or another during this conference, given all the beautiful music that has been shared with us. Thomas suggests that part of living in a soulful world is to read it. Here he gives the examples of using tea leaves or an obsidian mirror to receive information. His experience of the mirror is that through it a whole world opens up to him. His intuition is ablaze and when a question is asked the answers immediately come. He also gives the example of going to a client’s house and reading what’s there in terms of colours, feelings, the type of furnishings, in order to help the client move forward in life. 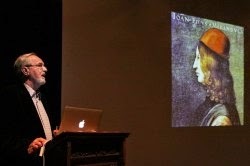 Thomas then shares with us some images to illustrate natural magic and its connection to soul. One of these images is of a medallion, created for a 15th century Italian magician named Pico della Mirandola, which has as a description of his life the Three Graces of beauty, love and pleasure. Thomas points out that soul likes pleasure, and he elicits laughter from the audience when he expresses how much he likes pleasure. As a finish to the session, Thomas offers the music of his daughter’s chanting [Ajeet Kaur]. Listening to her voice is a sublime experience, a gift that is indeed magical. I join those around me in honouring Thomas with a standing ovation."